John Romita Jr. 30th Anniversary Special, published by Marvel Publishing, Inc., 62 pages, $3.99. How did I miss this one? Published in 2006, Marvel’s John Romita, Jr. 30th Anniversary Special is one of those publications that gets fans of comics and comics history completely goofy and giddy. There are few more deserving of recognition, based on volume of work and important projects under their belt than Jr. This “salute” to his accomplishments is the next best thing to a hardcover book, such as The Art of John Romita, which covers his father’s career. 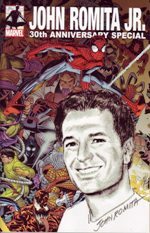 Featuring a timeline of his career from ‘77 to ‘06, a sketch gallery, a 16-page interview with Romita, Jr., testimonials from many other comics professionals to his talent, accomplishments and importance in the industry, a reprint of his first story done for Marvel’s American publishing branch, and more, this ought to hold the gentleman’s fans for some time. Of special interest to many will be the way John Jr. handled accusations of his father opening doors for him in the business. Personally, it doesn’t matter to me whether Sr. gave him a helping hand or not, though I happen to believe his son made it on his own merit. What matters is that he IS in comics, and the medium is better because of it. No other artist in the world of comics can put more raw power into a single character. Jr.’s figures fairly crackle with energy, even when they are standing still. And though I’ve contended in the past that his art has lost a certain “flow” over the years, I believe it’s because his characters have gotten “bigger,” filling the page even more, making it seem that they may leap from a flimsy pamphlet no longer able to contain their power. That’s progression of art style, folks, and sometimes you lose one thing for something else. It’s up to the fans to decide whether they think it’s worth it or not. Check out John Romita, Jr. 30th Anniversary Special yourself and see what you think.